This bandstand pavilion is located in Green Park, in the inner city suburb of Darlinghurst. 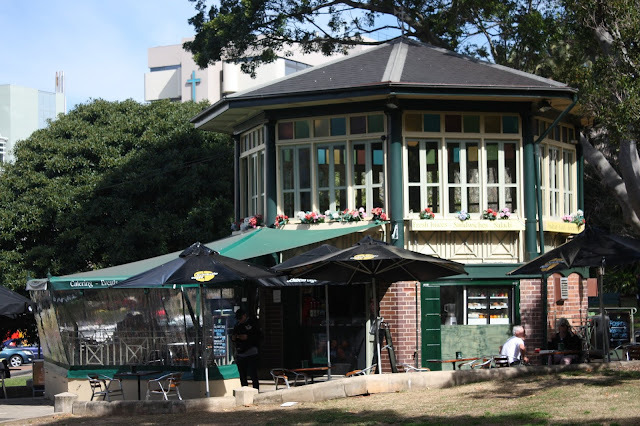 The heritage listed, two storey octagonal bandstand with a brick enclosed ground floor, was erected in 1925 to host public band concerts which were a popular feature of Sydney life in the interwar years. It was converted to a café in the early 1990s with an enclosed first floor. Set in its western wall is the foundation stone of the park which was originally on the corner of Victoria Street and Burton Street and is inscribed ‘Green Park Benjamin Palmer Mayor 1875-76’. Linked to: Theme Day, Wordless Wednesday, Wonderful Wednesday, Wednesday Around The World. It is a wonderful old building, Jim! Good one for the theme! I have tried to locate many outdoor bandstands, starting in Victorian UK and moving on to Edwardian Australia, wherever I could find them. But this stands out for two reasons. Firstly I have rarely seen a two storey building before. Secondly the building looked quite enclosed, so how did the music get out to the crowds of people who gathered around at concert time? It wasn't enclosed back in the days that it was used as a bandstand. It was enclosed much later. I am never disappointed when I stop by your blog. The buildings are always a treat for the eyes. Thanks for sharing. Thanks, Driller. I appreciate the feedback. I don’t think I have seen this building. I love the windows and window boxes. nice structure with interesting history.